This is my favourite picture of Grace. My wife took it. I think it looks like the moment in 70s TV Show credits where the action pauses and you see the name of the character. It could be for a show about an adventure toddler, or something. On New Year's Eve in 2013, we were bathing our 5-month old daughter Grace. Under the harsh bulb in my in-laws' bathroom, my wife Alice noticed that one of Grace's eyes was reflecting the light back, exactly like a cat's-eye in the road - it was unnatural, and unnerving. We Googled it and, like every internet-diagnosis, the answer came back ‘cancer’. 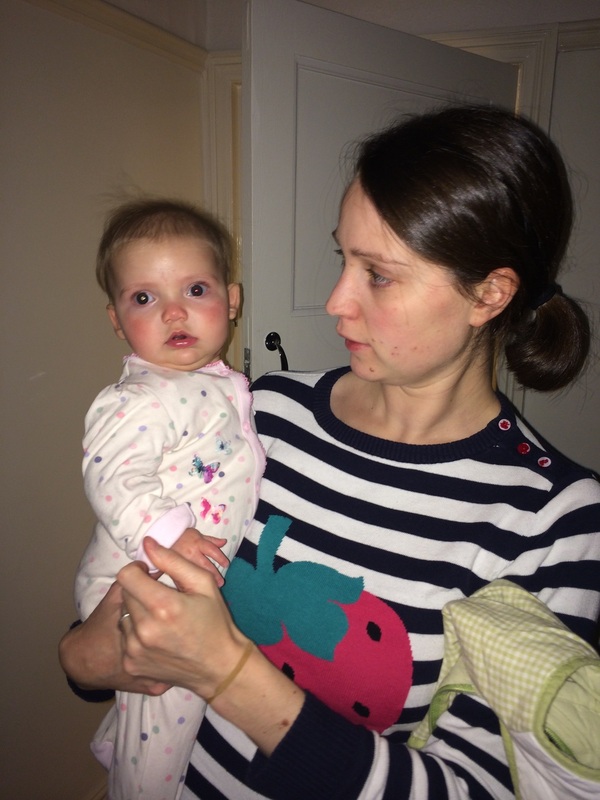 Normally we’d have chalked it up to the perils of using Google to assess the health of your child, but on this occasion there was a whole check list of symptoms for Retinoblastoma – a rare eye cancer which only affects children – and Grace had pretty much every one of them. Here’s the picture we took to test this last one – as you can see, she only has red-eye in her left eye. You can read more about retinoblastoma and its symptoms on the NHS website. If you have a child of five or under and he or she displays any of these symptoms, make a GP’s appointment right now! This cancer is extremely rare – only around 50 children a year are diagnosed in the UK - so the chances are your Doctor will never have seen it before. You may need to guide your GP, asking them to carry out a red-reflex assessment and refer you to the paediatric ophthalmologist at your hospital. If you’re reading this and thinking ‘oh god, our child has a couple of those symptoms’ don’t panic – first of all they can be caused by other things, and second of all Retinoblastoma is literally the ‘best’ cancer you can get. The eye socket forms a natural chamber to contain the cancer and stop it spreading; there’s a perfect hole (the pupil) through which to treat the tumour via lasers; it doesn’t usually cause any real distress to the child (unlike something like leukaemia for example) – Grace wouldn’t have known anything was amiss, she felt normal and well; and it has a 98% survival rate, higher than any other type of cancer. It’s really only when it’s not picked up until very late that things get extremely difficult, and the technology is advancing in such a way that successful treatment is deliverable in ways not possible even just 3 or 4 years ago. Alice and I found all this out in Birmingham Children’s hospital a few days in to 2014. We’d been extremely lucky in that one of our local GPs had spotted Grace’s squint early so we were on the alert for eye problems. After our internet diagnosis we booked an appointment with another local GP for January 2nd, and he admitted Grace matched the symptoms for Retinoblastoma but felt it was unlikely to be that, so said he’d write to the hospital about it. A couple of hours later he phoned the house and said, you know what, this is silly, we should just get her seen. The ophthalmology clinic was the next day, another piece of luck. The paediatric ophthalmologist wasn’t there so we had an adult one – she said she’d never seen Retinoblastoma before but there was definitely SOMETHING in the eye, which was showing up on an ultrasound. After much waiting while she called people to help decide what to do next, we were referred to Birmingham Children’s Hospital. Only they and Great Ormond Street deal with this cancer – no one answered in London, someone did answer in Birmingham, and amazingly they had a cancellation and could fit us in the following Monday. So by a very fortunate (albeit dizzying) sequence of events, we went from our Google diagnosis to the specialists in Birmingham in 5 days. Grace was put under a general anaesthetic, examined by a surgeon with a microscope, and they found tumours in both her eyes – quite a big one in the eye that had reflected the light, and smaller ones in the ‘good’ eye. The plan was that every 3 weeks G would be lasered in Birmingham, and the following day she’d have chemotherapy in Leeds General Infirmary (in the event it was every 4 weeks; she just couldn’t get well enough in time). This would last for 6 or 7 cycles of chemo, after which she would either stop having chemo or have a different kind. With a lot of cancers you physically cut out the tumour either before or after chemo, but with Retinoblastoma losing the eye is the last resort, and removing just the tumour can make it unstable and cause it to spread, so the lasering would continue after chemo had finished. Basically the idea is just to kill the tumours, rather than ever removing them. Eventually she’d stop needing the laser, and reduce the frequency of visits to be knocked out and examined – she’d go to being seen by Birmingham every 6 weeks (that's where we are now, a year into treatment), then every 8 weeks, then longer gaps. Even though this cancer only really affects children under five years old, Grace will be being checked at least once every 6 months until she’s sixteen! It felt like our whole lives were already mapped out until at least 2030. The NHS was amazing from the start. Everyone was nice, clear, and matter-of-fact. So many people were ‘assigned’ to us – two surgeons, two oncologists, nurses, eye specialists, a geneticist, a social worker. We realised over time that they were giving us more and more information each time we went for an appointment – there’s too much to handle all at once the first time you find out, so they start with the headlines. What mattered was that Grace was young – we’d caught the cancer at 5 months, before the tumours had become huge or had a chance to exit the eye socket via the optic nerve and cause more serious harm elsewhere in the body. From the beginning, the oncologist and surgeon were talking in terms of saving Grace’s ability to drive! Not her life, or even her sight – you can legally drive if your field of vision is windscreen-sized, and that’s what they were, and still are, hoping to preserve. All this was extremely reassuring. It was scary of course, but we felt we could deal with it. We’ve always been extremely lucky, and fully aware of and thankful for that good fortune; we almost felt due something like this, and luckily it seemed like it might not be too bad. Our child had cancer, but it was the best cancer to have, and she had it before she was old enough to understand or fear what was happening to her. We could do this. 2014 would be more or less a write-off, but we could get through it. What really scared me was the prospect of subjecting her to chemotherapy. Essentially, systematically poisoning our baby girl over a period of 7 months. As soon as her tiny body had recovered enough, we’d do it again – it turned out this was once every 4 weeks or so, but sometimes she’d be too sick and we’d have to put it off another week. Remember, the cancer didn’t really affect her directly. She couldn’t see much out of the bad eye so she’d just switched it off – she only knew vision as being from one-eye only and that was fine for her. She didn’t feel ill. She didn’t know anything was wrong. But now she would feel incredibly ill for months during treatment. We had to make an appointment for some surgery to put a port under her skin – a way to administer the programme of chemotherapy she’d be given which had go directly into her heart. It’s a scary thing, when your child isn’t yet 6 months, to subject them to that. Obviously leaving the cancer unchecked wasn’t an option – it would have started to cause problems fairly soon if it hadn’t been treated. But nevertheless I found it hard, psychologically: it was our giving her chemotherapy that was going to make her feel horribly ill for half a year, and it felt cruel. I was repeatedly grateful that it was happening when she was too young to really know anything about it – too young to dread her next treatment. The port caused a strange bulge under her skin and we were given a ‘Chemo Duck’ by Leeds General Infirmary, a soft-toy duck with a port and needle plugged into it, to help explain to Emily, our older daughter, why her sister would look slightly different in the bath. This worked really well, and Em was never freaked out by G’s appearance. The administering of the chemotherapy itself was okay. It took about 4 to 6 hours, and as she progressed over the 7 months she had it for, she became more and more mobile and harder to entertain for that amount of time. You’re plugged into a drip so running around isn’t really an option… She didn’t seem that bothered by the actual process – they give you anti-sickness drugs as part of it, and she didn’t seem uncomfortable with having the chemicals pumped into her. It was the fallout from the chemo that was the problem. When she started chemotherapy Grace was 5 months old and beginning to develop a personality – but that was essentially put on hold until she was 1. Chemo completely subdued her. Presumably she just felt rotten the whole time. She’d spend a lot of time quietly sucking her thumb, watching, and contemplating. Towards the end of each cycle she’d begin to feel well again and start to smile and laugh more, hints of what she would have been like all the time without the drugs, and then we’d take her down to Birmingham to be lasered on the Monday, and to Leeds to have chemo on the Tuesday and she’d go back to being quiet. She hated to be put down during this period, we basically carried her round for months as she preferred being held. Not held sitting down, mind you. She wanted to be on the move, but in our arms. It affected physical development too. Chemo makes food taste metallic and unpleasant so our attempts to wean Grace were a lot more complicated than our weaning of Emily a couple of years earlier. Grace needed all of her energy to fight what the chemo was doing to her, and didn’t have enough left to grow. She went from being basically average height and weight, to being very light and very short. Emily is a giant, in 6-7 years old clothing even though she’s four. Grace is the opposite, only just getting into 12-18 months clothes even though she’s now over one-and-a-half. Chemotherapy attacks your whole body. The drugs are so toxic we had to wear gloves when changing G’s nappies. Chemo is the medicinal equivalent of bombing an entire village of innocent people to kill one hostile enemy somewhere within it. The body’s ability to fight infection is taken away, so you become simultaneously much, much more susceptible to getting ill, and much more vulnerable when you do. A cold can cause serious problems. Measles can be fatal. The practical upshot for a baby going through that is that the baby is ill a LOT, and that illness needs to be treated instantly and at length. Every time Grace had a temperature of 38 degrees or more, or any other signs she wasn’t well, she had to go straight into hospital in Leeds (we live in York) for intravenous antibiotics. Of all things about 2014 this was the most stressful – never feeling like you’re more than a day or two, or even an hour or two, from having to drop everything and go in. There was literally no point in making any plans. We cancelled everything. Sometimes she’d be in hospital for days at a time, and if she had a cold she had to be kept in isolation. My wife had to be with her at all times because G was breast-feeding. I can’t imagine the feeling of claustrophobia – a sort of life-wide claustrophobia – and I don’t know how Alice coped, especially as she didn’t have more than about 3 hours sleep consecutively in the whole of 2014. When you have chemo you have low platelets – these are cells which help stop you bruising and bleeding. They act as a gentle clotting agent to make your blood behave as it is supposed to. You or I have a 'platelet count' of between 150 and 400 (that actually means 150,000 - 400,000 platelets per microliter of blood), anything below 150 is potentially problematic. On occasion, G's platelet count was as low as 6. So Grace bruised very easily, and of course she was learning to walk and constantly falling over and knocking into things. She was forever having blood transfusions, and platelet transfusions (sometimes both on the same day) – because really bad things can happen if the platelet count gets really, really low, below 10: like brain haemorrhages. That was stressful because we had to make that judgement call ourselves, as to when her platelets needed checking. We saw her bruising progress by degrees, so I think we were somewhat immune to it and didn’t realise how bad it looked. When I look back at the photos above now, she looks shockingly ill.
Because Grace was so vulnerable to infection, during and for a while after chemo she couldn’t go pretty much ANYWHERE. She couldn’t go in shops. She couldn’t go in other people’s houses. She couldn’t go into the middle of town. Any enclosed space or space with lots of people in was off-limits. This has pretty profound implications for how you organise your days… Especially with an older child to entertain. We could only ever do social things (or logistical things like shopping) one parent at a time. Incredibly excited about seeing crowds for the first time! This is a photo of her first visit into York city centre, when the chemo had worked its way out of her system, by September. She LOVED it. She was yelping with excitement just to be among crowds, when this picture was taken. We’ve never taken anything for granted, but when something as simple as being able to visit the centre of your own town as a family is an exciting treat, it certainly makes you think. 7 long months of chemotherapy, in which all you can do is put your head down and plough onwards, taking the only path open to you. No time for reflection really. You don’t assess much. You just keep going. It’s like being in a snow-storm – you can’t see more than a few feet in front of you, and there’s no point in looking back. You just keep walking until, if all goes well, you come out the other side. How’s she doing, people ask. She’s doing well, but it doesn’t mean she’ll continue to do so, we’d answer. We hope so, but we don’t know. The Oncologists and surgeons always qualify any good news with ‘but there’s a long way to go and these things don’t conform to strict patterns’. I don’t know if you’ve ever been in a big room with motion-sensitive lighting – like the stacks of a library, for example. As you move forwards, the shelves immediately in front of you are lit up. And even if you’ve successfully negotiated your way through a whole bunch of shelves, and nothing has tripped you up, you STILL can’t see that far ahead, and success so far has no bearing on whether the floor is clear in the parts you can’t yet see. That’s what it’s like. So far, the way has been clear. But we still don’t know what awaits us in the as-yet dark parts of the stacks. At the time of writing, things are good. Fantastic, really. Chemo is done and dusted and she didn’t need a second course – she responded well to it, and the tumours shrank, making them easier to laser. She’s no longer vulnerable to infection – if she gets a temperature we can give her Calpol! Instead of driving her to Leeds for 4 days! Amazing… This means our lives are fairly straight-forward compared to 6 months ago. We’re approaching normality. The tumours in the good eye are all dead. The tumour in the bad eye is dying. For the last 3 months we’ve been to Birmingham, she hasn’t needed lasering, and no new tumours have developed. We’re told if it continues to go like this, with no treatment needed, for another 18 months, we might even be able to cautiously say ‘she doesn’t have cancer anymore’. But anything can happen in those 18 months. It never really goes away, the risk. No one over 5 years old gets Retinoblastoma back, but Grace was born with this cancer due to a genetic defect – she’ll always be at much higher risk than most, to many other types of cancer. (No sun-bathing for you I’m afraid, my beautiful little girl.) She'll have a 50/50 chance of passing it on to each of her own children if she has them, but she could chose to go through IVF so that they'll be able to screen her eggs and choose the ones which don't carry the broken genes. But she’s still here, and she’s so, so happy now. About 4 months after her final chemo it was fully out of her system and her real personality began to emerge. She’s not so much of a quiet observer now. She’s a riot. Loud, smiley, laughy, talkey (in her own made up language). Defiant. She has to wear a patch over her good eye for an hour a day, to make sure the bad eye doesn’t switch off entirely. She has peripheral vision in it, and that will come in handy later, so we need to keep them both working. She hates patch-time. Sometimes she tries to take the patch off and I shout ‘NO!’ at her, and she stares back at me. Completely expressionless. No longer trying to remove the patch, but wanting me to know she’s unwilling to back down. Do you have any idea what I’ve been through, she seems to be saying? You’re just a cross Dad, that’s nothing to me now… I’ve had CHEMO. This conflict is easy. She’s already handful, and that makes me proud. Our older daughter Emily is challenging in all sorts of ways (!) but dealt with this brilliantly, despite our having to frequently drop everything and go into hospital while she stays with Grandparents. She hasn't been jealous of all the attention G (neccessarily) receives, and she's coped with the fact that any semblance of a routine went out of the window for the best part of the year. She's been awesome. We have been spectacularly well set up to deal with all of this. Our families are incredibly supportive and live close by. Alice took an unpaid career break which we could afford. My work have been amazing and allowed me as much time as I’ve needed – which has been a lot, just for purely logistical reasons with so many hospital visits and having an older child to care for too - and my amazing colleagues have covered for me and kept everything working. Our friends have been so helpful. (If you know someone who is very ill or whose child is ill, offer them practical things – picking up their children from nursery, or cooking for them. It makes such a difference.) Alice’s colleagues bought us a dishwasher and a tumble-dryer! I can honestly say that without the dishwasher, 2014 probably wouldn’t have been possible… The NHS have been fantastic. We’ve been well looked after. I find conversations difficult at the best of times, but this is a particularly tricky subject. People are sometimes embarassed and unsure how to respond when the answer to their question is 'she has cancer' so you try not to mention it. But then sometimes you can see the conversation heading towards it with a sense of inevitability, because they're going to ask whether we'd like to come over to their house ("we can't, Grace can't go in houses, she's having chemotherapy") or why she's wearing a patch ("she's got cancer in both her eyes but less in the one with the patch on"). So maybe you should mention it early so the way in which you skirted round it before doesn't become immediately and awkwardly obvious in retrospect, when you finally do mention it? The knowledge of the cancer weighs heavily, like an unexploded bomb gradually slipping out of your hand, above to drop into the conversation at some point, changing it completely. Social media has helped me with all this: the asynchronous nature of the conversation, and not needing to worry so much about the awkwardness, has given me an outlet when things have got a bit too much – and my network on Twitter has been incredibly helpful and supportive, listening, responding, encouraging. So thank you, everyone who has helped.